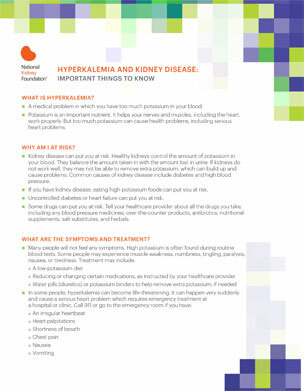 The information on this page has been designed to help patients by raising awareness about the link between high potassium, chronic kidney disease, and congestive heart failure. 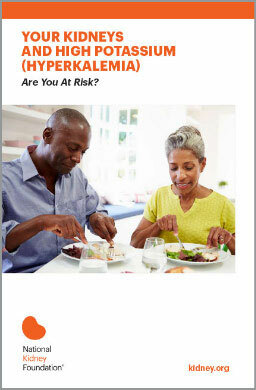 Are you at risk for high potassium? This video features a conversation between a Dr. Les Spry, a nephrologist, and Dr. Laura Byham-Gray, a dietitian. Filmed live in a studio, it provides information about the dangers and effects of High Potassium and diet as they relate to kidney patients. 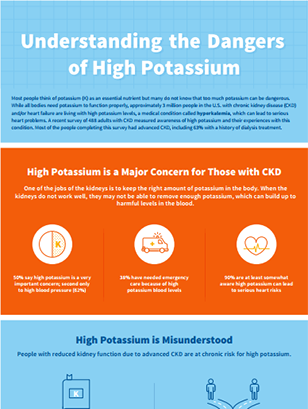 In this engaging video, you'll learn about High Potassium from a patient who is living with kidney disease. Listen as they discuss when they first learned they had a problem, how they've been dealing with it medically and psychologically, how their family and friends play a role in their care and well-being, as well as other important information on this topic. Hear from a true survivor about how he copes with symptoms of high potassium through discipline, education, will power and the help of his devoted companion.